The parish of Antony established a poorhouse in 1751. Another existed at Rame. County of Cornwall: Antony (3), Botusfleming, St Germans (3), St John, Landrake-with-St-Erney, Landulph, St Mellion, Pillaton, Quethiock, Rame (2), Saltash (2), Sheviock, St Stephen's by Saltash (2). Counties of Cornwall and Devon: Maker. Later Additions: Millbrook (from 1896), Torpoint (from 1904). The population falling within the union at the 1831 census had been 16,069 with its parishes ranging in size from Botusfleming (population 279) to Antony (3,099) and St Germans (2,586). The average annual poor-rate expenditure for the period 1834-36 had been £6,174 or 7s.8d. per head of the population. The St Germans union workhouse was built in 1837-8 at Torpoint. It was designed by Charles Lang who was also the architect of the Launceston Union workhouse. The Poor Law Commissioners authorised the sum of £4,300 on construction of the building which was intended to accommodate 250 inmates. The workhouse location and layout are shown on the 1894 map below. St Germans workhouse site, 1894. St Germans did not follow any of the standard plans of period. There was a T-shaped entrance range at the south of the site which contained a porter's lodge and board-room with a school room to the rear. The main accommodation block included the dining hall at its centre, with male accommodation to the west and female to the east. Further buildings at the north of the site may have included an infirmary block. St Germans workhouse from the east, c.1910. 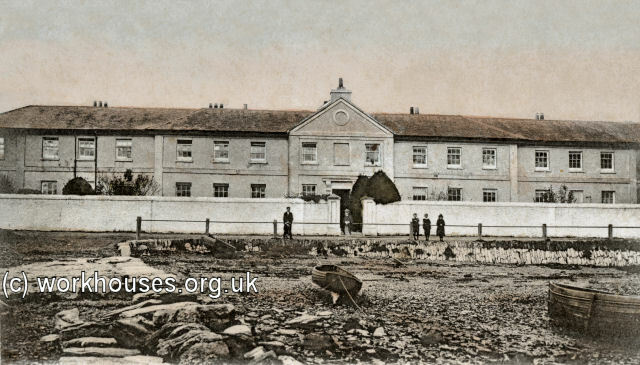 St Germans workhouse from the south-east, date unknown. After 1930, the workhouse was redesignated as a Public Assistance Institution. After its closure in the 1940, the building fell into dereliction for many years and was finally demolished in 1962. A block of flats was then erected on the site. 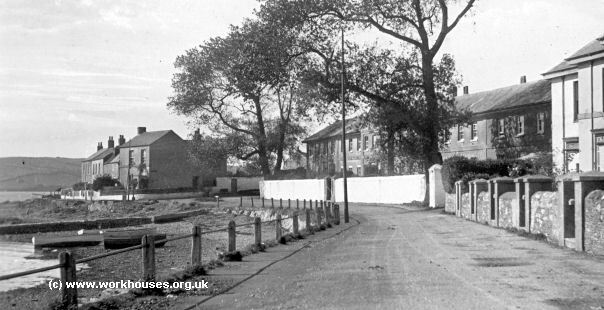 In the early 1900s, the St Germans Union set up a children's home at Anderton Villas, Lower Anderton Road, Millbrook. Cornwall Record Office, Old County Hall, Truro, Cornwall, TR1 3AY. Relatively few records survive. Holdings include: Guardians' minute books (1837-39, 1891-5, 1911-30); Ledgers (1856-60, 1909-17, 1920-26); Union cases book (1837-61).